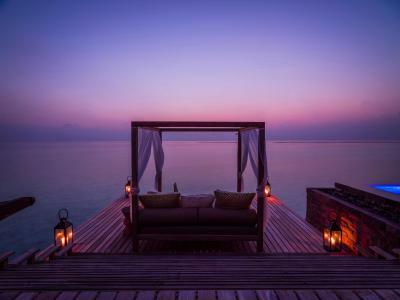 Lock in a great price for One&Only Reethi Rah – rated 9.4 by recent guests! Excellent for a trip with kids. Fantastic property and legendary service. Really amazing resort with lots of facilities and activities. Staff were very kind and friendly. 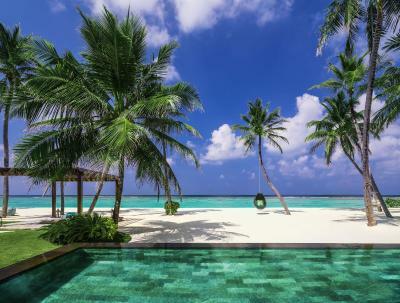 I recommend staying at the beach villas located on the east side it has a clear sea. Clean, classy, island a good size with fantastic facilities. Nothing is too much trouble here and we loved every minute of our honeymoon. 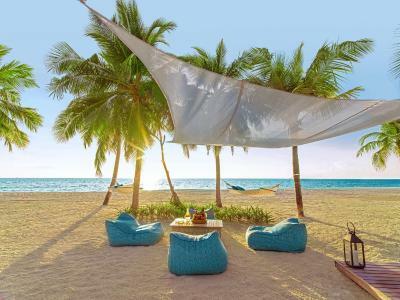 A true paradise! 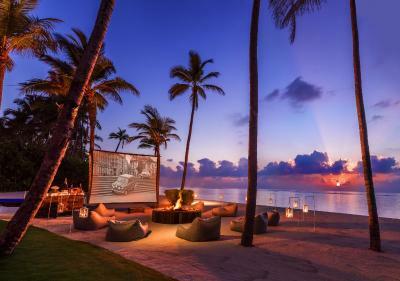 Best location in Maldives! The staff was incredibly friendly, cheerful and helpful. The food was absolutely delicious, so many choices, so many different cuisines with impeccable service. The rooms are big and spacious and the beds are beyond comfortable! Excellent cocktails at the bar by the pool with great music performance each night! Excellent service. Extremely friendly and helpful staff. Great facilities and fantastic island. 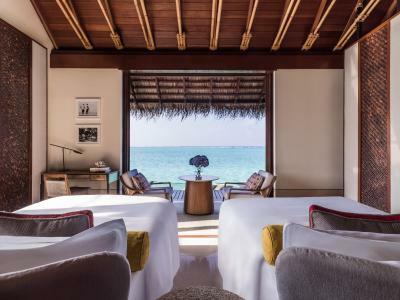 One&Only Reethi Rah This rating is a reflection of how the property compares to the industry standard when it comes to price, facilities and services available. It's based on a self-evaluation by the property. Use this rating to help choose your stay! 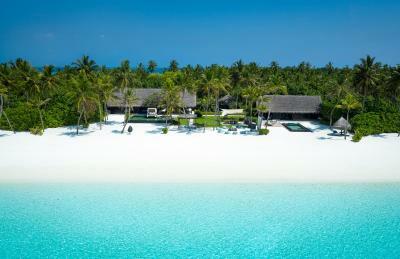 One & Only Reethi Rah is located in Maldives’ North Male Atoll. 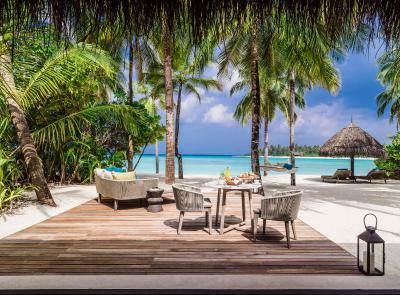 This luxurious tropical getaway overlooks the Indian Ocean and offers an infinity pool, free Wi-Fi and a peaceful private beach. 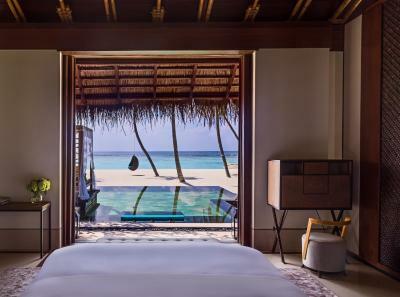 The elegant villas at One & Only Reethi Rah are located either over the lagoon or by the beach and enjoy beautiful ocean views. Flat-screen cable/satellite TVs, iPod docks and DVD players can be enjoyed in all rooms. Guests may enjoy massage treatments at One&Only Spa or rejuvenate with a game of tennis at the outdoor courts. 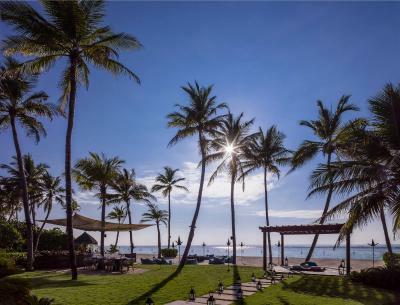 The resort also has a beach club - One Tribe, catered to teenagers and KidsOnly, a spacious activity place for children facilitated by well-trained staff. 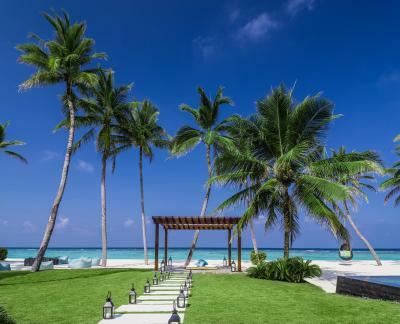 Built over the water, Tapasake Restaurant serves modern Japanese cuisine, while the beachside Fanditha Restaurant offers Middle Eastern food and champagne. 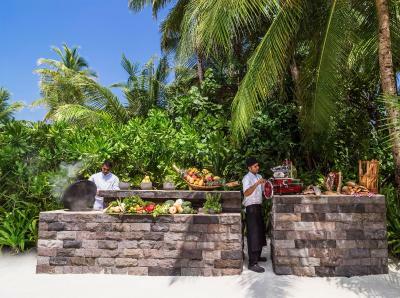 Reethi offers Mediterranean cuisine. 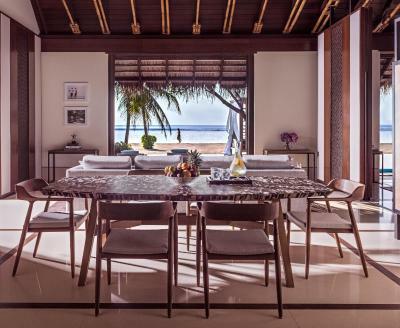 Other dining options include Rah Bar and 24-hour in-villa dining. 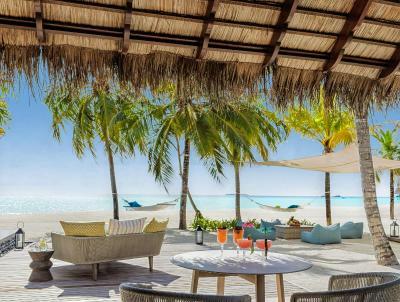 One & Only Reethi Rah is a 75-minute luxury yacht ride or a 45-minute speedboat ride away from Male International Airport. 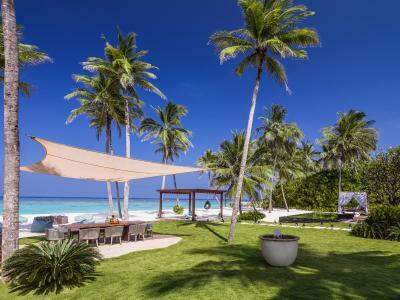 This property also has one of the top-rated locations in Reethi Rah! Guests are happier about it compared to other properties in the area. 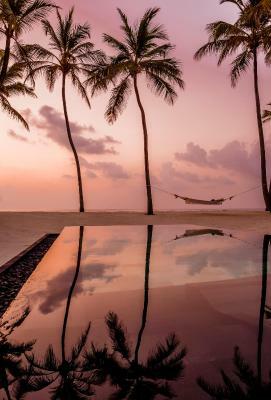 When would you like to stay at One&Only Reethi Rah? 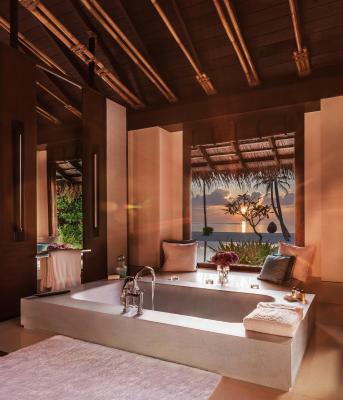 Features a terrace with lounge chair and over-sized terrazzo bathtub. Luxurious villa built over the lagoon. 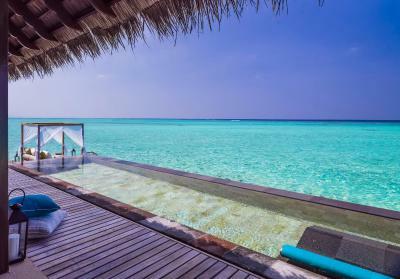 Please note, children under the age of 11, are not allowed to stay in the Water Villas. No extra beds are available. 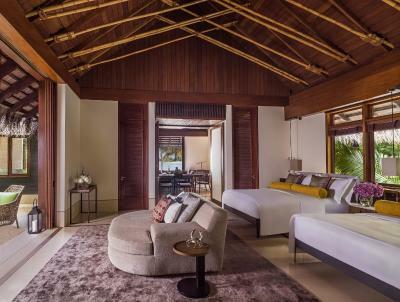 Built over the lagoon, villas are fitted with a queen size bed and features a private pool. 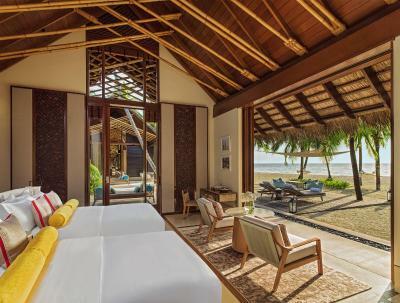 Fitted with 2 queen beds, villas are built over the lagoon. 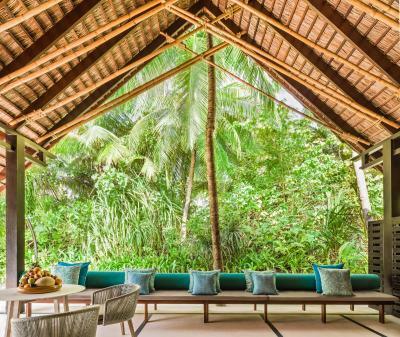 These spacious villas are nestled within tropical foliage. 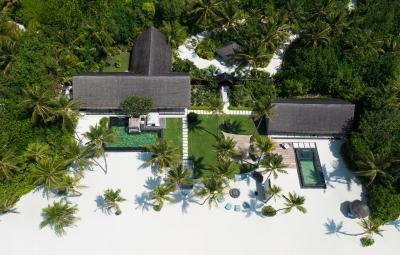 They have a private stretch of beach, a 538 ft² pool, shaded porches equipped for open-air dining, and a canopy daybed. 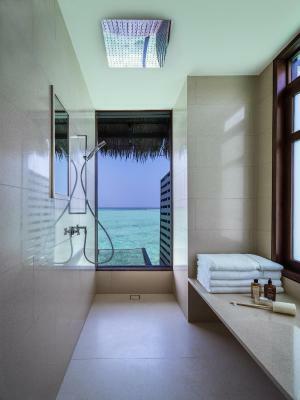 They also have two spacious bedrooms, a sitting area facing the sea, and a large stone soaking bath designed for two. 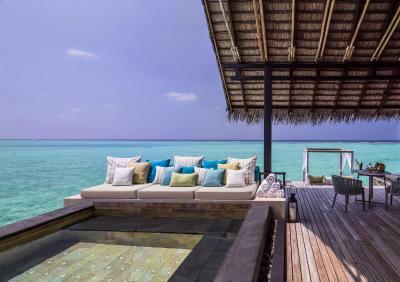 Surrounded by spacious decks and wraparound hammocks suspended over the water, this villa is set on stilts and features an infinity pool, an open-air hot tub and a platform with lounge chairs. 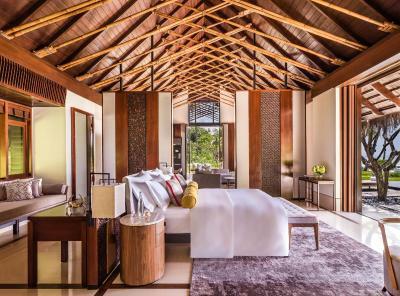 This villa also includes separate dining and sitting areas and a spacious bathroom with bathtub for 2 with walk-in rain- and jet showers and a steam room. 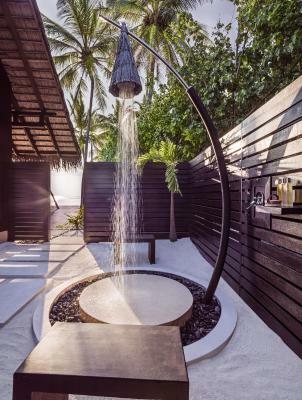 In green surroundings, this villa features an outdoor shower and a porch. 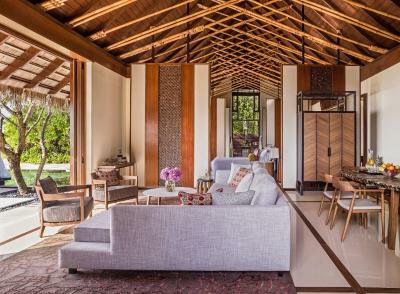 A spacious living space with an entertainment area, a shaded porch and a private swimming pool is provided. 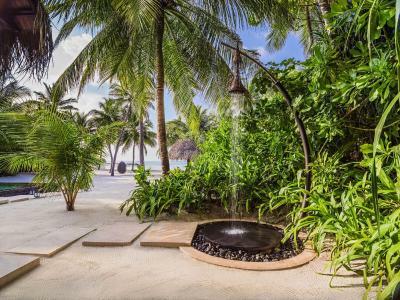 An over-sized terrazzo bath, a walk-in rain and jet shower and twin vanity sinks are found in the bathroom. 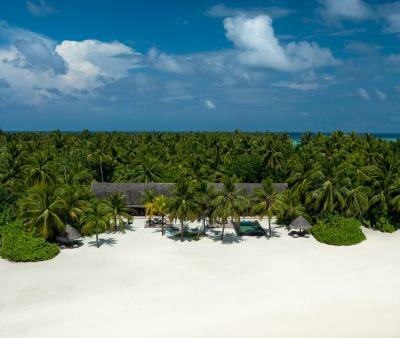 Two exclusive 4-seater golf carts provided, allowing guests to explore the island, which is 109 acres. 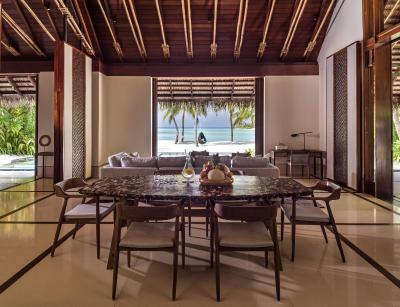 This villa has air conditioning, dining area and flat-screen TV. This villa has a bathrobe, iPod dock and DVD player. 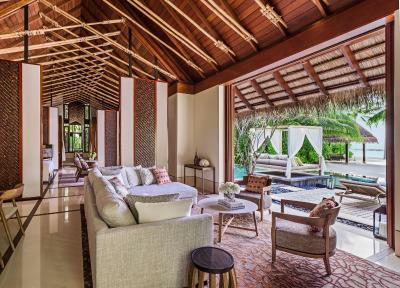 This villa features a private pool, air conditioning and microwave. 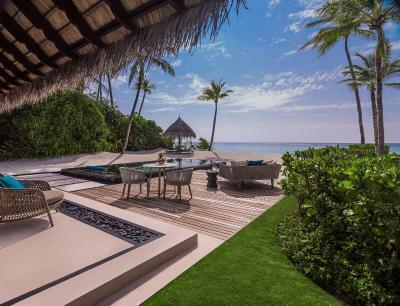 This villa features a balcony, view and satellite TV. 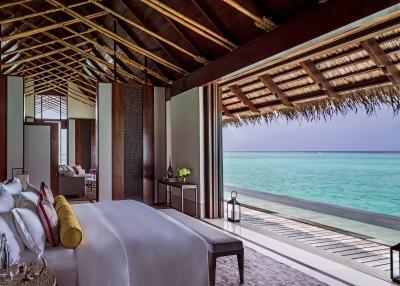 This villa has a balcony, sea view and mini-bar. 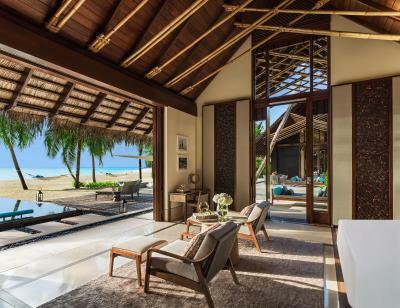 This villa features a balcony, bathrobe and flat-screen TV. 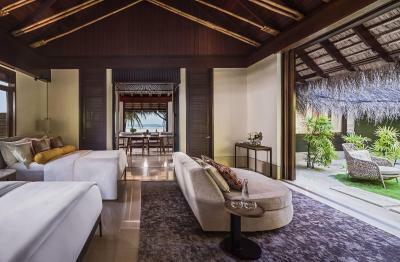 This villa features a balcony, air conditioning and CD player. 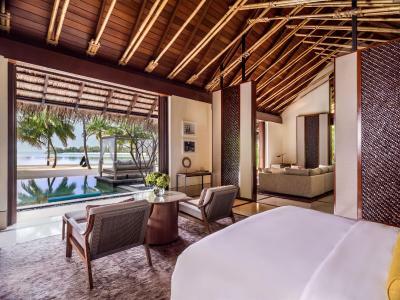 This villa has a balcony, electric kettle and seating area. 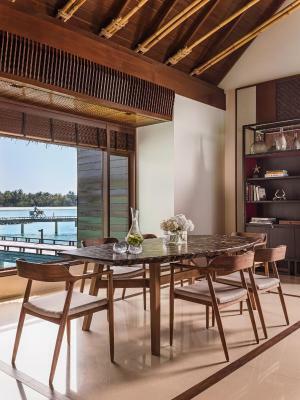 This villa features a balcony, dining area and electric kettle. This villa has a balcony, sofa and electric kettle. 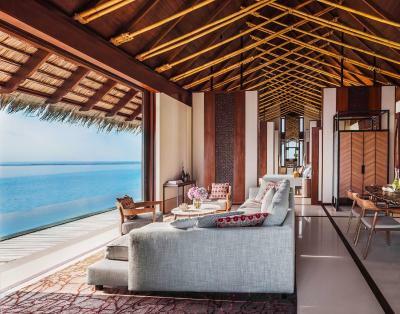 Set on one of the largest islands in North Malé Atoll, One&Only Reethi Rah is home to 122 private villas discreetly placed along the shore – with 90 Beach Villas secluded by lush tropical greenery, and 32 Water Villas set above the clear, protected waters of the lagoon. 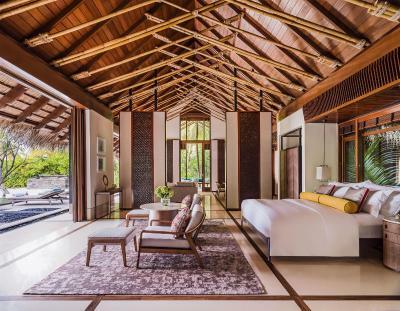 Among the largest resort villas in the world, each is attended by a personal Concierge and a dedicated Villa Valet. 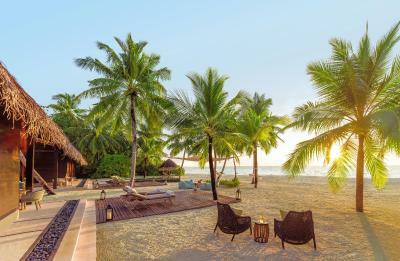 This ultra-luxury all-villa resort in the Maldives offers unrivalled level of style, choice and personalized exploration. 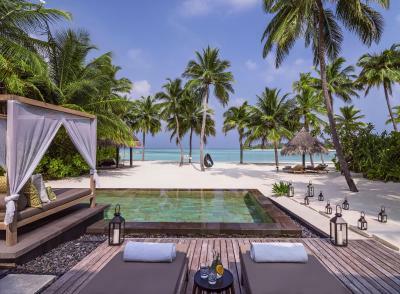 Sleek and spectacular, with unprecedented privacy, One&Only Reethi Rah presents the ultimate holiday experience to those seeking the pinnacle of tropical luxury. 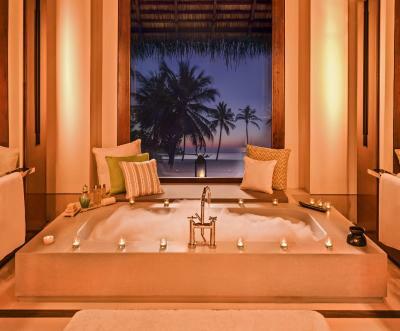 House Rules One&Only Reethi Rah takes special requests – add in the next step!